INFORMATION-EDUCATION The size of the world's smallest guitar will shock you. 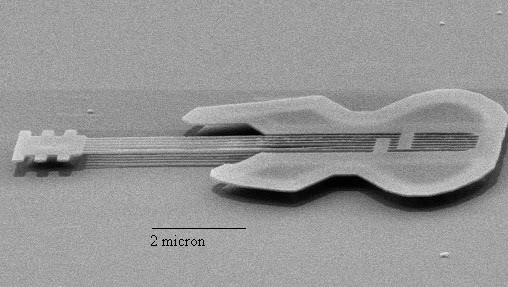 The size of the world's smallest guitar will shock you. This amazing instrument was developed by Cornell University researchers. This guitar is very tiny, is only ten micrometers long. Micrometers, which means, VERY SMALL. It would take ...one million micrometers to make one meter. The guitar is made just like a real guitar, it has a body, a bridge, six strings, etc. Each string is about one hundred atoms thick. It was designed with new technology, using crystalline silicon, which is expected to be used for a new generation of electromechanical devices. Sadly, this guitar is inaudible to the human ear. Yes, it can be played, but probably only micro-organisms will be the only guys able to hear the music.